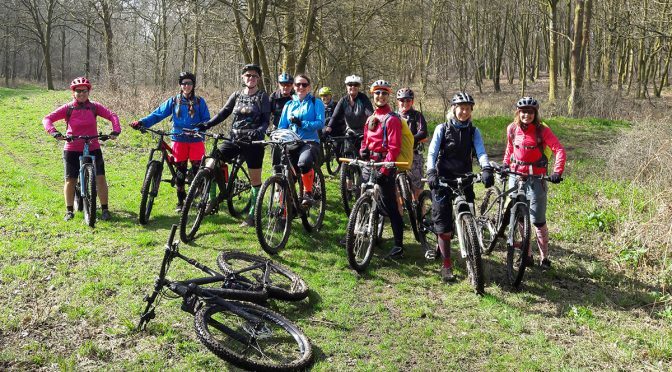 Kate Davidson repeats this picturesque rural ladies’ ride which was very popular last year, taking in the tracks and trails of Savernake Forest and a few local historical landmarks, with a cake stop en-route. This will be a novice-friendly ride, at the pace of the slowest rider, but you should be comfortable riding 17 miles over mildly undulating terrain with a few short hills, and probably some mud, along the way. We’ll meet at Postern Hill campsite, on the outskirts of Marlborough, where there is plenty of parking. From the campsite we’ll ride into the forest, picking up some nice singletrack and fire roads, emerging at the far end of the Grand Avenue and riding onwards to the hamlet of Durley. From here, we drop down onto the Kennet and Avon Canal towpath, stopping for tea and cake at Crofton Beam Engines and once refreshed we’ll head back to the forest and make our way back to the campsite. Athough being April it should be springlike, it may be wet and/or muddy in the forest. Bring anything you feel you may need such as water, weatherproof coat and spare tubes etc. Meet ready for a 10.00am start. Terrain/Difficulty: Fire roads, gravel tracks, grassy singletrack, a few hills within the forest, towpath and a short ride or two on the road. Nothing very technical. Shops/Pubs/Cafes: Café en route serving tea, coffee, cakes and snacks. Toilet facilities.